Synonyms and Other Names: Micropterus dolomieui is a common misspelling. Identification: Becker (1983); Page and Burr (1991); Etnier and Starnes (1993); Jenkins and Burkhead (1994); Moyle (2002). Native Range: St. Lawrence and Great Lakes, Hudson Bay (Red River), and Mississippi River basins from southern Quebec to North Dakota and south to northern Alabama and eastern Oklahoma; Atlantic and Gulf slope drainages from Virginia to central Texas (Page and Burr 1991). Table 1. States with nonindigenous occurrences, the earliest and latest observations in each state, and the tally and names of HUCs with observations†. Names and dates are hyperlinked to their relevant specimen records. The list of references for all nonindigenous occurrences of Micropterus dolomieu are found here. Status: Established in most of the above states. Reported in Mississippi. Impact of Introduction: In Arizona, Smallmouth Bass reportedly are responsible for eliminating or reducing some populations of native fishes (Minckley 1973). Smallmouth Bass have been shown to eat smolts of Pacific salmonids, therefore posing a threat to these already declining species in the Columbia River (Dentler 1993). Similar trends have been observed in other major rivers of the Pacific Northwest, with Smallmouth Bass consuming up to 35 percent of outmigrating wild salmon. Kuehne and Olden (2012) found that juvenile Chinook Salmon Oncorhynchus tshawytscha showed fewer anti-predator flight and panic responses when exposed to Smallmouth Bass odors compared to odors from native Northern Pikeminnow Ptychocheilus oregonensis, indicating that salmonids may not recognize Smallmouth Bass as potential predators and prey naivety enhances success of novel predators. Smallmouth Bass experience a niche shift, switching food preference from insects and zooplankton to crayfish and fish, that causes competitive interactions with many other fish species (Carey et al. 2011). Jenkins and Burkhead (1994) speculated that introduced Smallmouth Bass may have contributed to the demise of an isolated population of Trout-perch Percopsis omiscomaycus in the Potomac River in Virginia and Maryland. Smallmouth Bass were introduced into Flaming Gorge Reservoir to reduce the Utah Chub Gila atraria (Teuscher and Luecke 1996). Introduced predatory centrarchids are likely responsible for the decline of native ranid frogs in California and for the decline of California tiger salamander Ambystoma californiense populations (Hayes and Jennings 1986; Dill and Cordone 1997). Nonnative predators, including Smallmouth Bass, have been shown to reduce the abundance and diversity of native prey species in several Pacific Northwest rivers (Hughes and Herlihy 2012). The presence of Smallmouth Bass, along with other introduced piscivores, reduced the richness of native minnow communities in Adirondack lakes (Findlay et al. 2000). Introduction of Smallmouth Bass may be driving isolation and population fragmentation in Umpqua Chub (Oregonichthys kalawatseti) in lower order streams in the Smith River drainage, Oregon (O'Malley et al. 2013). Introduction of the Smallmouth Bass into the native range of Guadalupe Bass M. treculii in southcentral Texas has resulted in hybridization between the two species (Edwards 1979; Whitmore 1983). This hybrid bass is found in Canyon Lake and the San Marcos system, Guadalupe River drainage, on the Edwards Plateau in Texas (Whitmore 1983; International Game Fish Association 1994). It was first recognized by Edwards (1979) and later verified by Whitmore (1983). The hybrid is fertile and is capable of backcrossing to the parent species, with more backcrossing to Smallmouth Bass than to Guadalupe Bass (Whitmore 1983). Introgressive hybridization represents another threat to the already depleted Guadalupe Bass by compromising its genetic integrity (Whitmore 1983). Although Lake Travis, on the Colorado River, also has been stocked with Smallmouth Bass, Whitmore (1983) found no evidence of hybridization there. Bean et al. (2013) used microsatellites to estimate introgression rates of Smallmouth Bass within Guadalupe Bass in the Brazos, Colorado, Guadalupe-San Antonio, and Nueces drainages; introgression was found within 4 subbasins, with rates highest in the Guadalupe subbasin. 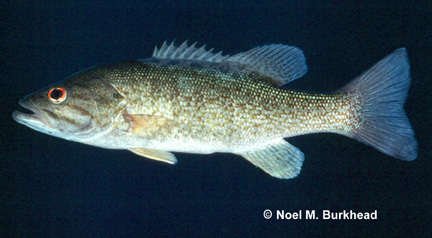 The Smallmouth Bass also hybridizes with the Spotted Bass M. punctulatus when stocked in the Spotted Bass's native range or when both species are stocked in the same area. The Smallmouth/Spotted Bass hybrid has been found in the Verde River, Arizona (Minckley 1973); California (Moyle 2002); the Marmaton River, Barbour County, Kansas (Cross 1967; museum specimen KU 4682); and southeastern Oklahoma (formerly described as M. punctulatus wichitae) (Cofer 1995). A third hybrid resulting from stocking Smallmouth Bass is the Smallmouth/Largemouth hybrid. Introduced Smallmouth Bass hybridize with native Largemouth Bass in Squaw Reservoir in northcentral Texas (Whitmore and Hellier 1988). There are a few benefits despite the negative impacts of Smallmouth Bass. Bass anglers account for a high influx of revenue in the Pacific Northwest, which helps supports the existing fisheries as well as conservation and management efforts in the region. In addition, anglers enjoy increased bag and size limits for Smallmouth Bass. These regulations allow anglers to play a role in managing the native fish populations by decreasing non-native population size (Carey et al. 2011). Remarks: Introduced bass likely affect small fish populations through predation. Tyus et al. (1982) gave a distribution map of the this species in the upper Colorado basin. MacCrimmon and Robbins (1975) showed a map depicting this species' native and introduced range. Anonymous 2001. Oregon's Warm Water Fishing with Public Access. [online]. URL at http://www.dfw.state.or.us/resources/fishing/warm_water_fishing/index.asp. Anonymous. 2004. 'Brazen' act of putting smallmouth bass in county pond upsets DIF&W. Bangor Daily News. August 2, 2004. Baxter, G.T., and J.R. Simon. 1970. Wyoming fishes. Bulletin No. 4. Wyoming Game and Fish Department, Cheyenne, WY. Behnke, R.J. and R.M. Wetzel. 1960. A preliminary list of the fishes found in the fresh waters of Connecticut. Copeia 1960(2):141-143. Carey, M.P., B.L. Sanderson, T.A. Friesen, K.A. Barnas, and J.D. Olden. 2011. Smallmouth bass in the Pacific Northwest: a threat to native species; a benefit for anglers. Review in Fisheries Science 19(3): 305-315. Cheney, A.N. 1897. Black bass and their distribution in the waters of New York State. 176-184 in Second annual report of the Commissioners of Fisheries, Game and Forests. New York State Fisheries, Game and Forest Commission. Albany, NY. Cofer, L.M. 1995. Invalidation of the Wichita spotted bass, Micropterus punctulatus wichitae, subspecies theory. Copeia 1995(2):487-490. Conner, J.V., and R.D. Suttkus. 1986. Zoogeography of freshwater fishes of the western Gulf Slope of North America. Pages 413-456 in C.H. Hocutt and E.O. Wiley, eds. The zoogeography of North American freshwater fishes. John Wiley and Sons, New York, NY. Cooper, E.L. 1983. Fishes of Pennsylvania and the northeastern United States. Pennsylvania State University Press, University Park, PA.
Cross, F.B., R.L. Mayden, and J.D. Stewart. 1986. Fishes in the western Mississippi basin (Missouri, Arkansas, and Red Rivers). Pages 363-412 in C.H. Hocutt and E.O. Wiley, eds. The zoogeography of North American freshwater fishes. John Wiley and Sons, New York, NY. Dahlberg, M.D., and D.C. Scott. 1971. Introductions of freshwater fishes in Georgia. Bulletin of the Georgia Academy of Science 29:245-252. Dentler, J.L. 1993. Noah's farce: the regulation and control of exotic fish and wildlife. University of Puget Sound Law Review 17:191-242. Edwards, R.J. 1979. A report of Guadalupe bass (Micropterus treculi) x smallmouth bass (M. dolomieui) hybrids from two localities in the Guadalupe River, Texas. The Texas Journal of Science 31(3):231-238. Everhart, W.H. 1976. Fishes of Maine. 4th edition. Maine Department of Inland Fisheries and Wildlife, Augusta, ME. Fowler, H.W. 1906. The fishes of New Jersey. Pages 35-477 in Annual Report of the New Jersey State Museum (1905), part II. MacCrellish and Quigley, State Province, Trenton, NJ. Hartel, K. 1992. Non-native fishes known from Massachusetts freshwaters. Occasional Reports of the MCZ Fish Department 1992:1-9. Hayes, M.P., and M.R. Jennings. 1986. Decline of ranid frog species in western North America: are bullfrogs (Rana catesbeiana) responsible? Journal of Herpetology 20(4):490-059. Hubbs, C., and A.E. Peden. 1968. Notes on the distribution of blackbass (Micropterus) in the San Marcos River, Hays County, Texas. Texas Journal of Science 20(2):193-194. Hubbs, C.L., and K.F. Lagler. 1947. Fishes of the Great Lakes region. Cranbrook Institute of Science, Bulletin 26:1-186. Bloomfield Hills, Michigan. Hubert, W. 1994. Exotic fish. Pages 158-174 in Parrish, T.L., and S. H. Anderson, eds. Exotic species manual. Wyoming Game and Fish Department, Laramie, WY. Idaho Fish and Game. 1990. Fisheries Management Plan 1991-1995. Appendix I. A list of Idaho fishes and their distribution by drainage. Idaho Fish and Game. International Game Fish Association. 1994. World records. IN IGFA. World Record Game Fishes. International Game Fish Association. Kraai, J.E., W.P. Provine, and J.A. Prentice. 1983. Case histories of three walleye stocking techniques with cost-to-benefit considerations. Proceedings of the Southeastern Association of Fish and Wildlife Agencies 37(1983):395-400. Kuehne, L.M., and J.D. Olden. 2012. Prey naivety in the behavioural responses of juvenile Chinook salmon (Oncorhynchus tshawytscha) to an invasive predator. Freshwater Biology 57:1126-1137. Lampman, B.H. 1946. The coming of the pond fishes. Binfords and Mort, Portland, OR. Lee, D.S. 1980. Micropterus dolomieui Lacepede, smallmouth bass. Page 605 in Lee, D.S., C.R. Gilbert, C.H. Hocutt, R.E. Jenkins, D.E. McAllister, and J.R. Stauffer Jr, eds. Atlas of North American freshwater fishes. North Carolina State Museum of Natural History. Raleigh, NC. Linder, A.D. 1963. Idaho's alien fishes. Journal of the Idaho Museum of Natural History 6(2):12-15. Loyacano, H.A., Jr. 1975. A list of freshwater fishes of South Carolina. Bulletin of the South Carolina Experimental Station 580:1-8. MacCrimmon, H.R., and W.H. Robbins. 1975. Distribution of black basses in North America. Pages 56-66 in Stroud, R.H, and H. Clepper, eds. Black bass biology and management. Sport Fishing Institute. Washington, DC. Maciolek, J.A. 1984. Exotic fishes in Hawaii and other islands of Oceania. Pages 131-161 in W.R. Courtenay, Jr., and J.R. Stauffer, Jr., eds. Distribution, biology, and management of exotic fishes. The Johns Hopkins University Press, Baltimore, MD. Miller, R.R. and C.H. Lowe. 1967. Part 2. Fishes of Arizona. Lowe, C.H., ed. The Vertebrates of Arizona. University of Arizona Press, Tucson, AZ. Neale, G. 1931. Spiny-rayed fresh water game fishes of California inland waters. California Fish and Game 17(1):1-17. Pflieger, W.L. 1971. A distributional study of Missouri fishes. University of Kansas Publications, Museum of Natural History 20(3):225-570. Raasch, M.S., and V.L. Altemus, Sr. 1991. Delaware's freshwater and brackish water fishes - a popular account. Delaware State College Center for the Study of Del-Mar-Va Habitats and the Society of Natural History of Delaware, Dover, DE. Rasmussen, J.L., 1998. Aquatic nuisance species of the Mississippi River basin. 60th Midwest Fish and Wildlife Conference, Aquatic Nuisance Species Symposium, Dec. 7, 1998, Cincinnati, OH. Red River Authority of Texas. 2001.Red and Canadian Basins Fish Inventory: Red River County. Rohde, F. C., R. G. Arndt, J. W. Foltz, and J. M. Quattro. 2009. Freshwater fishes of South Carolina. University of South Carolina Press, Columbia, SC. Ross, S.T., and W.M. Brenneman. 1991. Distribution of freshwater fishes in Mississippi. Freshwater Fisheries Report No. 108. D-J Project Completion Report F-69. Mississippi Department of Wildlife and Freshwater Fisheries and Parks, Jackson, MS.
Schmidt, R.E. 1986. Zoogeography of the northern Appalachians. Pages 137-160 in C.H. Hocutt and E.O. Wiley, eds. The zoogeography of North American freshwater fishes. John Wiley and Sons, New York, NY. Sigler, W.F., and R.R. Miller. 1963. Fishes of Utah. Utah State Department of Fish and Game, Salt Lake City, UT. Stone, M.D. 1995. Fish stocking programs in Wyoming: a balanced perspective. Pages 47-51 in Schramm, H.L., Jr., and R.G. Piper, eds. Uses and effects of cultured fishes in aquatic ecosystems. American Fisheries Soceity Symposium 15. American Fisheries Society. Bethesda, MD. Teuscher, D., and C. Luecke. 1996. Competition between kokanees and Utah chub in Flaming Gorge Reservoir, Utah-Wyoming. Transactions American Fisheries Society 125(4):505-511. Tyus, H.M., B.D. Burdick, R.A. Valdez, C.M. Haynes, T.A. Lytle, and C.R. Berry. 1982. Fishes of the upper Colorado basin: distribution, abundance, and status. Pages 12-70 in Miller, W.H., H.M. Tyus, and C.A. Carlson, eds. Fishes of the upper Colorado River system: present and future. Western Division, American Fisheries Society. Bethesda, MD. Walker, P. 1993. A list of the endemic and introduced fishes of Colorado-March 1993. unpublished. Webster, D.A. 1942. The life histories of some Connecticut fishes. Pages 122-227 in A fishery survey of important Connecticut lakes. State Geological and Natural History Survey of Connecticut, Department of Environmental Protection, Hartford, CT.
Whittier, T.R., D.B. Halliwell, and R.A. Daniels. 2000. Distributions of lake fishes in the Northeast - II. The Minnows (Cyprinidae). Northeastern Naturalist 7(2):131-156. Whittier, T.R., and K.E. Hartel. 1997. First records of redear sunfish (Lepomis microlophus) in New England. Northeastern Naturalist 4(4):237-240. Whitmore, D.H. 1983. Introgressive hybridization of smallmouth bass (Micropterus dolomieui) and Guadalupe bass. Copeia 1983(3):672-679. Whitworth, W.R. 1996. Freshwater fishes of Connecticut. Bulletin 114. State Geological and Natural History Survey of Connecticut, Department of Environmental Protection, Hartford, CT.
Whitworth, W.R., P.L. Berrien, and W.T. Keller. 1968. Freshwater fishes of Connecticut. Bulletin 101. State Geological and Natural History Survey of Connecticut, Department of Environmental Protection, Hartford, CT.